I made some changes to that 12" set up as well, I bent the cross-bar in the shop press to splay the legs, ditched the eye bolts- no more hardware. These thing take a beat down. Get my 3/8" 500's from Sub-MOA. Use gas pipe for the frame, 5/8" rebar legs. Hang the plates with 3/8" rebar, bullets glance off if not directly shot at. 300Mag @ 100y? Not even a scratch. Makes cool splat marks in the paint, wipe right off with a finger. Gota hit it with a .50 BMG ball at 300y to dent the surface. Looks like some of my setups. I've also had success in a straight 4ft length of 3/8 rebar from home depot with a 1/2" washer welded to the side near the top. 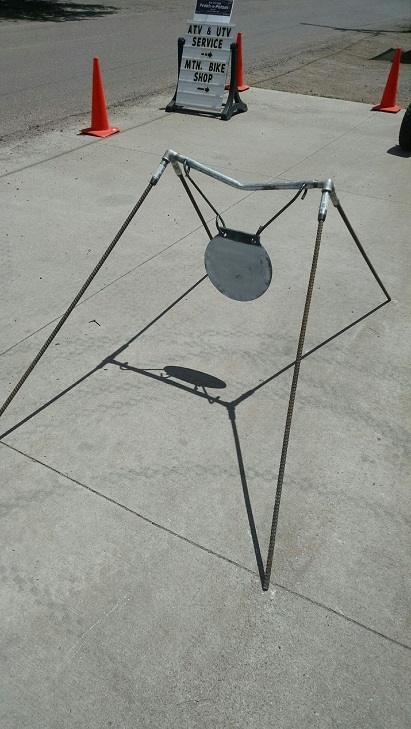 I also welded on a foot peg... just drive 2 of these into the ground when I want to shoot, the top bar is just another piece of rebar with 2 more washers welded on and chain going down to the gong. It just slips into the side support's washers. Simple, works great, portable. 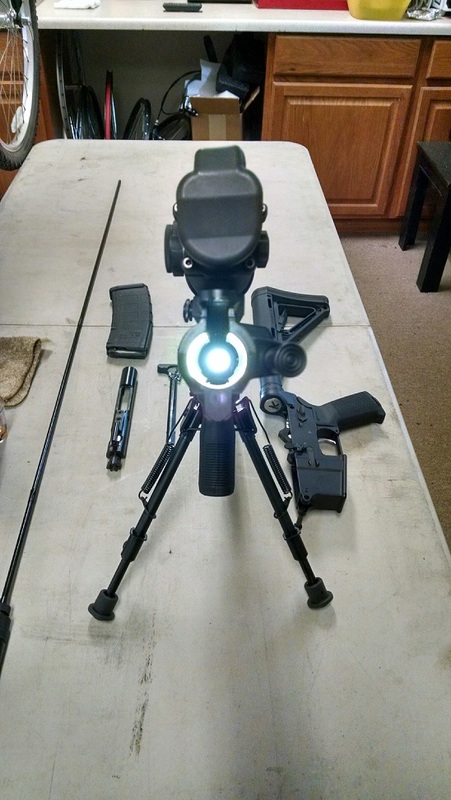 I need to order up a 12" gong, I want to play with setting up at 4 or 500 yards. I was always jealous of the range Hickok45 has. 500 rounds as of last week, still going strong. Sight was a nice upgrade. Now we've added a bi-pod. She can now smack steel @ 100y pretty well with a generic CPFP 335gr bullet- which is little more than a Minie-ball for the most part. It still get's everyone's attn., esp. when you connect on a 20# plate and it goes BABLANG and flops like a carp on a dock! 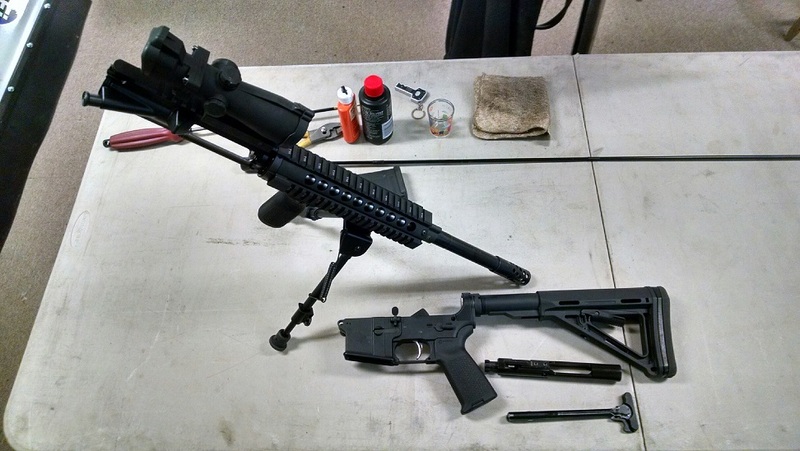 Just how big is the 12.7mm bore on a .50cal AR? NICE!!!!! I have been wanting the 50 Beowulf but haven't got there yet. 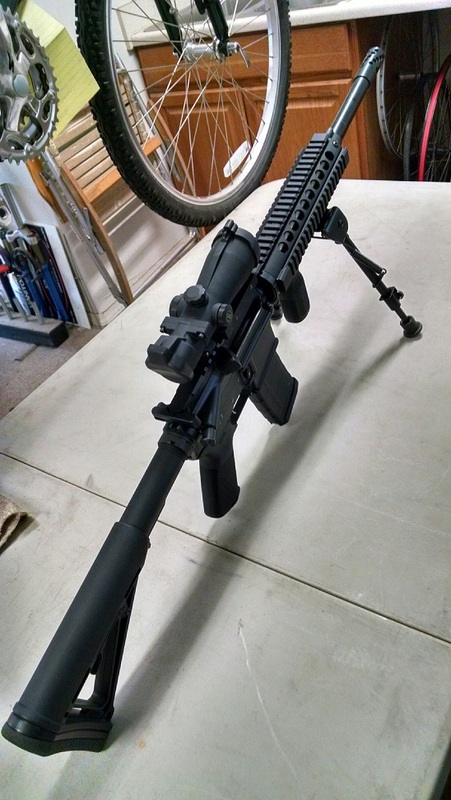 I am still having fun with it's little brother 6.5 Grendel, three deer so far! Damn coyotes don't show themselve when I have the Grendel in the field. I have never wanted one of those evil black assault weapons but my local gun store guy has just about convinced me that I need a "modern sporting rifle" for the least expensive way to get into three gun. I am a little late but I have lots of ammo and a thousand or so pieces of brass to load up- all 223/5,56. I was planning on a Ruger Mini 14 but after everything is said and done I can be completely set up for less wit the AR. I will probably end up with two of them one purchased and the other one built. I like the idea of having something the feds and state boys don't know about. Oh, the ammo I have is for my two single shot pistols; one in 223 and the other in 7mmTCU. Until I get the evil black assault weapon I have a lifetime supply of ammo. I would not recommend a Mini 14. Reliable but not accurate enough for what you need. Plus you won't find the accessories you will want. I recently built one for 3gun. 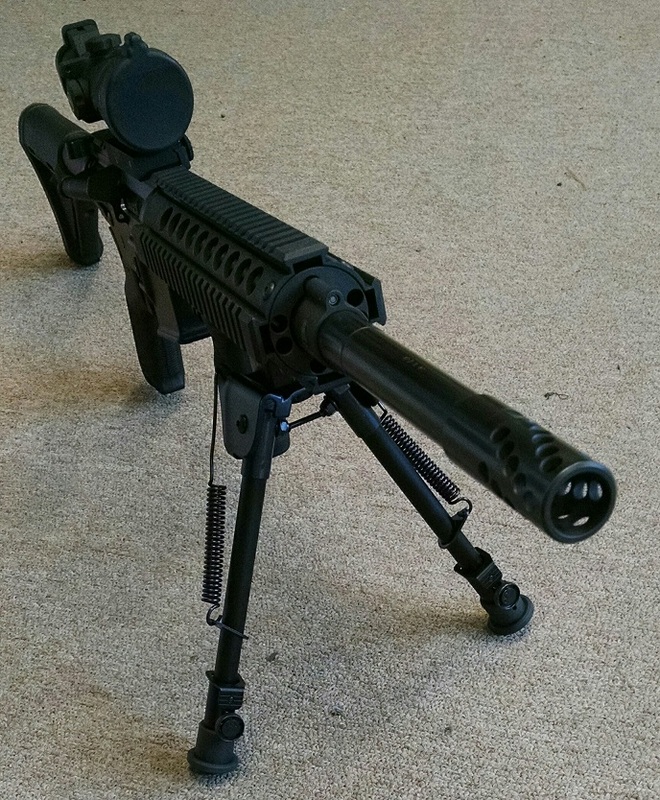 18 inch, rifle gas, 1:8 twist with a good compensator. It shoots like a dream. Rifle gas is very soft. 1:8 is needed to stabilize 77 grain SMK for longer range engagements. Got my barrel from ARP Performance. 6.5 Grendel, Alexander Arms Upper, Lower, Barrel, Vltor collapsible stock (Magpul PRS Bench Stock), JP adjustable trigger, Troy free float tube, and Lucid 6-24x50 scope. My bench lower is an EP Armory 80% poly lower with JP adjustable trigger. 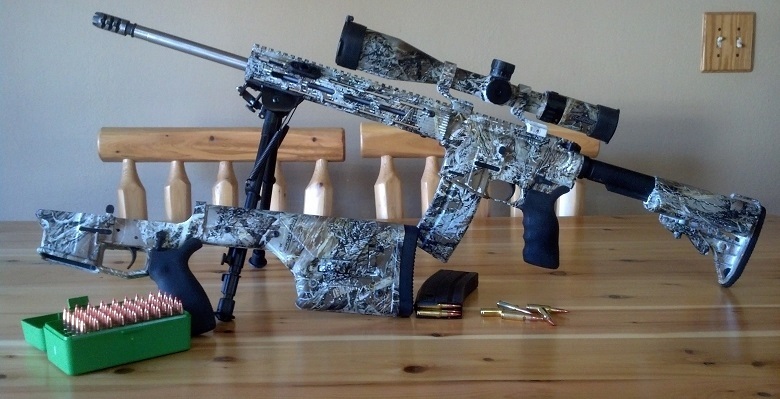 Custom Hydro Dipped True Timber MC2 Snow Camo. Hey Wiers where'd ya get that buttstock (what's it called) on the bench and is it adjustable? Nice job on the camo! I have a pair of poly 80% lowers, very light indeeeeed. Not hard to make either, I used my drill press. Ah gee...And all I got is just a plain old a DPMS LR308 (AR-10) with iron peep and post sights. That stock is the Magpul PRS it is very handy on the bench with all of its adjustments. I can get really comfy behind it.